Join the discussion on our forums! 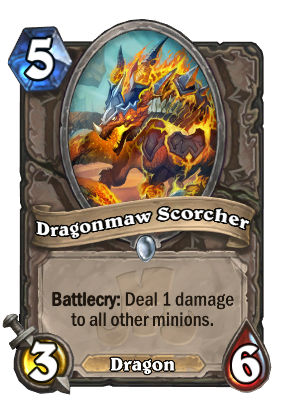 Come discuss Dragonmaw Scorcher over in our dedicated Dragonmaw Scorcher discussion topic. This card is such a great card tech in Secret Hunter, better than Mossy Horror versus Paladins because it is 5 cost! And also with an Explosive trap set-up good to deal with the 4 3/3s from opponent Spellstone .. it is a sleeper imo ! Very good dragon especially in warrior since it enables combos as well as clears small boards and enables execute effects.Whirlwind on a body is always welcome. So dragon warrior, dragon priest probably... Hunter will have better things to play with but mage wild dragon mage? Wild Dragon Mage is arguably better off sticking with Even-cost cards and abusing Coldarra Drake, but I could see it in a different formula.